Programme 12 noon - 4 pm at Taurus Crafts. 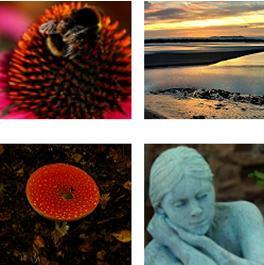 This includes an illustrated briefing with 10 key tips, a visit to Lydney Harbour covering composition, light & reflections, photo tour at Taurus featuring flowers, fabrics, pottery, plants, buildings and sculptures.. not to mention the Taurus bull!! and sun, shade and sky.This is followed by a photo de-brief a quick picture show with expert commentary and a quick photo clinic. Our courses are designed for everyone who wishes to improve their camera skills. This includes those who want to move on from the basics of point and click to those experienced enthusiasts looking for new challenges and vibrant landscapes. You can choose single day courses or weekend courses to suit your plans. Whichever you choose you will have a great time, improve your camera and image skills and learn more about the creative world of digital photography. EACH course limited to 8 people. This half-day course introduces you to the best digital photography techniques and gives you 10 tips to help you improve your photography and image management skills. No special kit is needed.. just bring your camera and you will have a briefing for 30 minutes and then three hours of supervised practice at selected locations in and around the Forest of Dean. Your course leader - Ewart Woolley: Ewart has trekked through the landscapes of Severn and Wye as a geographer, geologist and teacher. His experience includes twenty years of photography, more than 15 working with digital images and more recently leading Adobe Photoshop & digital camera skills courses at an international school and technology college.